Turkmenabat is a large industrial, commercial and cultural center of Turkmenistan. The economic attraction of this city has deep historical roots: once the Great Silk Road ran through this area where rich bazaars and magnificent caravanserais surprised the travelers and merchants. The history of civil aircraft of Turkmenistan originates from 1927 when the first airline, which has connected Chardzhou with Tashauz through Tourtkul and Novo-Urgench was opened. On this airline, the Chardzhou aviation enterprise used the “Junkers” JU-13, and airplanes K-4. In total 8 airplanes have been engaged. In 1932, the civil air fleet of Turkmenistan has been replenished with new Soviet passenger airplanes. These К-5 and ANT-9. On their base in the same 1932, the air division which began to serve the airline Chardzhou-Tashauz directly, without intermediate airdromes was created in the Chardzhou airport. Lebap velayat, the city of Turkmenabat, in 2018, the newly built international airport began to function successfully. The certificate issued by the Munich Airport of the Federal Republic of Germany confirms the compliance of the new airport complex of the Turkmenabat International Airport with the requirements of the International Standards of International Civil Aviation Organization (ICAO). Turkmenabat Airport International has a significant geographical advantage, as it occupies a convenient geographical position, located at the intersection of air routes leading from the CIS countries to Southeast Asia, Europe and America. With the intensive development of the industrial infrastructure of the region with the richest deposits of minerals, the socio-economic and living standard of the population increases, business and investment activity is growing. 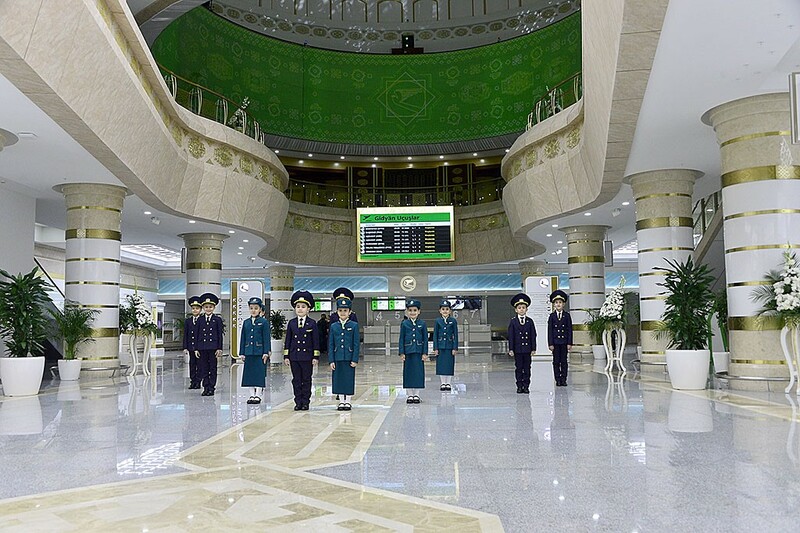 All this, as well as the modernization of a transport system throughout the country, necessitated the construction of a new airport in Turkmenabat with a handling capacity of up over 500 passengers per hour. The external design of the terminal reflects the key architectural style of the modern Turkmen urban planning. A bright planning feature of the structure is its shape. The building looks like an octagonal star of Oghuz Khan. For passengers of the new airport there are waiting and registration zones, mother and child rooms, as well as information boards, information desks, ticket offices, ATMs, food services area. 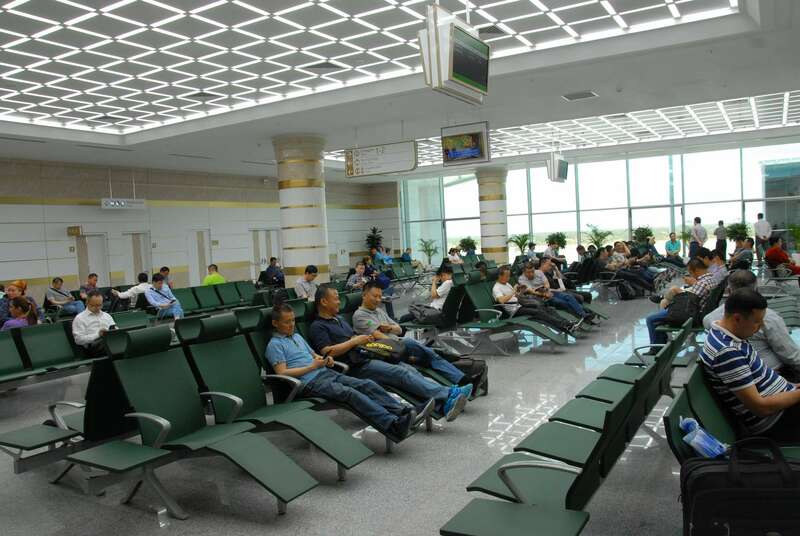 The terminal is divided into passenger service zones for domestic and international flights, which allows for optimizing the transit of passengers. The complex also includes a 55 meters high 11-floor control tower. The fleet is replenished with the latest generation of equipment, the growth rate of passenger and freight traffic and expansion of international flights have stipulated the introduction of new technologies into the air traffic control system. The French Company Thales has provided technical equipment for the air traffic control center of the Turkmenabat airport such as information and navigation systems, radio electronic devices. The systems provide full automation of workplaces with the high precision of air situation modeling and forecasting for any period of time, and makes it possible to reduce the impact of human factor on the air traffic control process. The necessary meteorological equipment has been installed in a separate block. The cutting-edge technology was used to equip a centralized fuel-filling station, fire and emergency-rescue units with depots. A large amount of work has been done to build an airfield infrastructure. The runway with an artificial cover is 3,800 meters long and 60 meters wide. The total area of concrete coating was more than 768.4 thousand square meters. Seven taxiways were built to allow aircrafts to take-off and land in a shorter interval of time. Lighting equipment and navigation aids have been installed. The runway of the Turkmenabat airport is capable of accepting any types of aircrafts even in severe weather conditions. The aerodrome site occupies 215 thousand 743 square meters. The parking facility is designed for 8 aircrafts. There is also a space for 4 helicopters on the platform. Aerodrome-technical base of the airfield, covering an area of 2 thousand 986 square meters, is integrated production workshops for repair and maintenance of aircrafts, including foreign airplanes, which reflects the important trend in the work of domestic airports for high-quality maintenance of aviation equipment and flight safety. The system for maintaining the airworthiness of civil aircrafts has the most complex specific equipment and necessary devices. In addition, the relevant qualified personnel have been trained. The airport complex also includes an administrative building of the Turkmenabat airport, a hotel, a medical center, a cargo terminal with a total area of 4 thousand 109 square meters with modern warehousing, weighing and electric hoisting equipment, X-ray and television systems. The cargo terminal is intended not only for carrying out operations related to accepting, storing and processing of various cargoes, and providing commercial information services for consignees and carriers. It is also a business center that unites participants in the cargo transportation process into a single logistics chain, which makes it possible to significantly shorten each application processing time with high quality of service. Freight traffic has a significant growth potential due to the further expansion of the Turkmen airline participation in the world market of transit and specific cargos transportation. Increasing demand for air cargo transportation is also facilitated by the transition of the Turkmen economy to an innovative development course. At designing and building of the Turkmenabat airport, all the features and nuances were taken into account with regard to the functional purposes of such facilities. Advanced engineering and technical developments have been implemented. Innovative technologies and best world practices have been introduced. And a harmonious combination of the national architecture techniques and modern achievements in this area were embodied in the architectural shape of the complex. The new airport complex of Turkmenabat is located several kilometers from the city outskirts in the immediate vicinity to the Ashgab- at-Turkmenabat highway and the Ashgabat-Kerki railway. Thus, with the construction of the airport near the administrative center of the velayat, a multimodal transport and logistics hub of this rapidly developing large industrial and agricultural region of the country has been formed.